DIAGNOSTIC FEATURES: Broad lobes; many powdery soredia arising from pseudocyphellae; pale brown undersurface; medulla C+ red; compare with P. missouriensis, few coarse soredia per soralium, cracks in the upper cortex and usually lobulate, P. borreri, with a black undersurface. 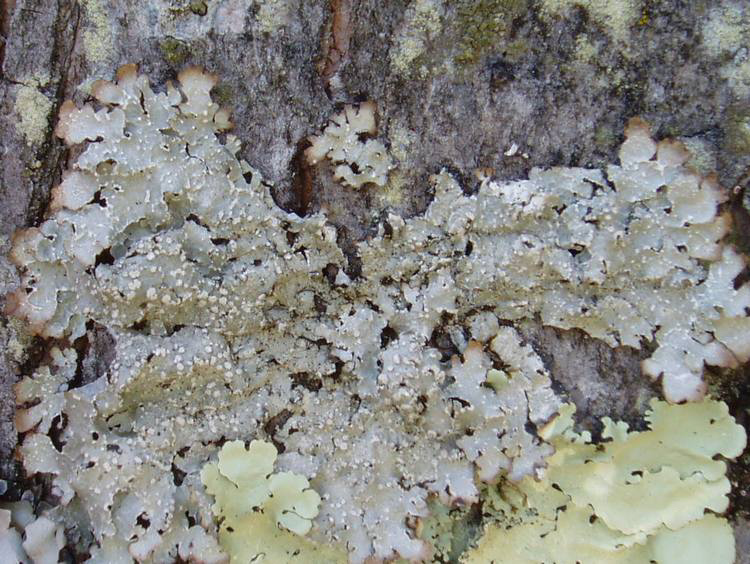 ECOLOGY: Widespread in the US; very common in Ohio, possibly present in every county; usually on bark, more rarely on rock. This species is fairly tolerant of air pollution. Until recently, this species also included what is now called P. missouriensis. Thus, the Ohio distributions of both species are probably somewhat incomplete.